The Browning Hi Power is one of the most revered pistols of all time. This ground-breaking firearm was originally designed by John M. Browning and perfected in the years following his death by Fabrique Nationale’s prolific designer, Dieudonne Saive. The Hi-Power is one of the most widely used military pistols in history, having been used by the armed forces of over 50 countries. 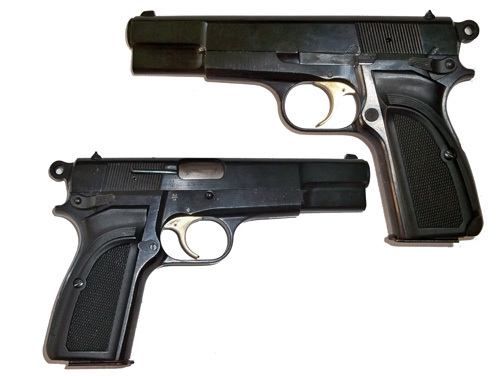 Browning Hi-Power pistols were used during World War II by both Allied and Axis forces. After occupying Belgium in 1940, German forces took over the FN plant. German troops subsequently used the Hi-Power, having assigned it the designation Pistole 640. High-Power pistols were also produced in Canada for Allied use, by John Inglis and Company in Toronto. The L9A1, was the British designation for the military version of the post-1962 Hi-Power. It started to replace Inglis variants in British service from the late 1960s, and the two types remained in service together until the Inglis variants were finally retired in the late 1980s. It is still in service with the UK military forces, although now fitted with the more ergonomic Mk2 ambidextrous safety and grips. The L9A1 was also widely used by other Commonwealth armed forces. This particular example was produced under licence in Hungry and is fitted with the modern ambidextrous safety and grips, round style hammer and gold plated trigger. It is finished to a good standard and comes complete with London Proof House certificate.